Swedish pop duo, Icona Pop, has been pumping out tracks that everyone wants to get their hands on. We've seen countless remixes of their original tracks "All Night" and "I Love It" with Charli XCX. 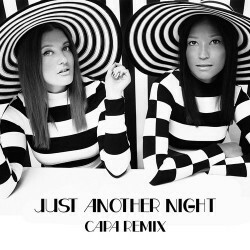 The latest remix is of their track "Just Another Night" from CaPa. The fellow Swedish DJ/Producer takes the original Icona Pop track from a slow pop song about a love triangle to new levels when he adds in progressive electro chords and a slapping drum kick to match. You won't find me complaining about the abundance of remixes, as long as Icona Pop can keep their tracks coming, I will gladly listen to every one of the remixes. Carolina and Aino's vocals transcend any genre's boundaries and I think that is why we hear their remixes on all types of dance floors.